In the 1970s America were the darlings of pop and rock radio. The trio (which became a duo) had a vocal blend and sound that were less threatening than the Eagles’, and they were enjoyed by teenage girls and middle-aged mothers alike who wouldn’t listen to Led Zeppelin. They even somehow even attracted the involvement of George Martin, who had produced such monsters as the Beatles and Jeff Beck. They always sounded like pretty nice guys, and they probably were and probably still are. America has never completely gone away, continuing to tour behind such classics as “Horse With No Name” and “Sister Golden Hair” and the airplay they still get on easy listening and classic rock stations. The two remaining members who have carried the torch, Dewey Bunnell and Gerry Beckley (Dan Peek left 35 years ago for a Christian music career), really never wrote much together, and their biggest hits were songs that they had written individually or had co-written with others. So on their new album, Back Pages, Beckley and Bunnell have wisely decided to perform songs that have influenced and motivated them, with many of those songs originally performed by artists whom they no doubt have had personal associations with. 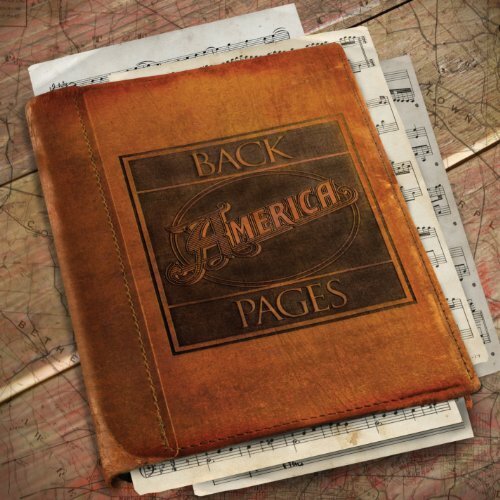 Titled for the Bob Dylan classic of the same name, Back Pages actually shows the gutsy side of America, in that they aren’t afraid to tackle some iconic material that many would have wisely shied away from. Songs like Joni Mitchell’s “Woodstock,” Neil Young’s “On The Way Home,” Paul Simon’s “America” and Jimmy Webb’s “Crying in My Sleep” are covered here, with music by some ace Nashville session men and production by Fred Mollin, who scored big (at least artistically) with his smart production of Webb’s Ten Easy Pieces a few years back. Instead of going strictly for nostalgia, though, Bunnell and Beckley were smart enough to realize that there have been some pretty good songwriters out there since the ‘70s. On this CD they included works by some more modern writers, including Fountains of Wayne’s Chris Collingwood and Adam Schlesinger (“A Road Song”), the Gin Blossoms’ “’Til I Hear It from You” by Gin Blossoms members Robin Williams and Jesse Valenzuela with Marshall Crenshaw, and the New Radicals’ “Someday We’ll Know,” written by principal New Radical Gregg Alexander with Debra Holland and child star Danielle Brisebois. Mark Knopfler’s excellent story song “Sailing to Philadelphia” is also featured, with Knopfler himself providing some great guitar. Mollin and the band opt for some period sounds, like the sitar-effected guitar on “Woodstock,” and the heavily overdone guitar effects (at least this reviewer thinks it’s a guitar, hard to tell in the digital age) on Rod Argent’s “Time of the Season,” which wouldn’t have suffered any if eight bars had been shaved off the solo. But hey, these guys are from the era of excessive noodling, so it works. America’s voices and ranges don’t seem to have changed a bit; if anything, these guys are just getting better, as they sing with the confidence that only age can bring. Back Pages may not win the band any new young fans in this era of hip-hop and Taylor Swift, but this is a well-done CD for baby boomers and their kids.